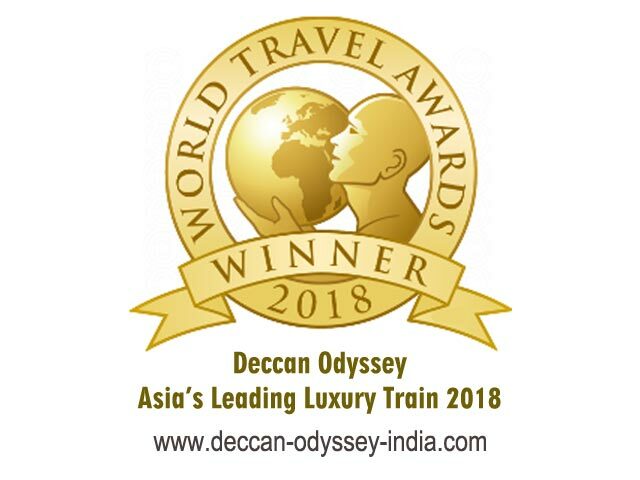 Deccan Odyssey, one of the Indian Luxury Trains, created history at the World Travel Award (WTA). India’s leading luxury train bragged the title of Asia’s Leading Luxury Train for the 5th time continuously. Reckoned as the premier luxury train of the country, the Deccan Odyssey offers incredible journeys and matchless service. The new star was added into the profile of the luxury train at a ceremony held at the Intercontinental Grand Stanford Hong Kong on 3rd September 2018. It is interesting to note that the special luxury train was bestowed with the award three times continuously earlier also, making a grand total of 8 times. Since ages, Deccan Odyssey has been pampering the travelers with an array of cultural experiences meticulously designed for them. Be it the famous Golden Triangle circuit, world heritage sites or the wildlife sanctuaries of India, the prominent Indian luxury train traverses all. Earlier, when the train was known as the Indian Maharaja, it brought the glory for three times in a row from 2010-2012. However, there was a halt in between for a year. But, the leading luxury train of India braced up and regained its title in 2014 and has been enjoying it since now. Arup Sen, Director, Special Projects, Cox & Kings told that the Deccan Odyssey has redefined the luxury with striking design and matchless service. Passengers are not only beguiled with unparalleled comforts but also an unusual window to travel India. The train’s excellence in facilitating remarkable sojourns and unimaginable experiences. The Deccan Odyssey helps to unveil the less popular cultural secrets of Indian. As the train glides through all major tourist destinations, passengers get deeper insights into the wonderful places in India. While embarking on any of the six magical journeys offered by the palatial train, one explores more than just a single aspect of the country. Depending upon the itinerary chosen, the Indian Luxury train takes guests to Gujarat, Maharashtra, Rajasthan, Karnataka, Goa, Andhra Pradesh and Delhi. Four splendid Presidential Suites with modern amenities and elegant décor add to the charm of the train. Utsav and Waavar, the two gourmet restaurants on board aid the guests to savor local cuisines of each of the diverse Indian state, the train travel to. The royal train also boasts of a lounge, a full bar and a beauty salon. Passengers can also enjoy state-of-the-art facilities and extraordinary features like round the clock Wi-Fi connectivity, LCD TVs and mobile phones in every cabin. Many people regard the World Travel Awards as the ‘Oscars of the Travel Industry’ which cherish excellence in global tourism. Deccan Odyssey consists of 12 passengers cars out of the 21 coaches. These cars can accommodate 8 people per coach (10 passengers/ deluxe Cars, 4 coupes per coach – 2 Presidential Suite Cars, 2 coupes per coach), 2 Dining Cars, 1 Entertainment/Conference Car, 2 Staff Cars, 2 Generator Cars with Luggage Store, 1 Bar Car and 1 Spa Car. The train can accommodate 88 passengers. Traveling in this Indian Luxury Train is really a matter of pride.